Welcome to Radar Blips, where I quickly highlight three shows that catch my eye. Go see a show and remember to tip your bartender. 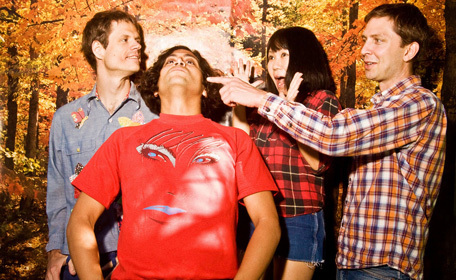 Despite being easily confused with the million other deer– bands out there, Deerhoof has been putting out noisy-experimental pop since the mid-90’s and kudos to the Luminary for supposedly being the first to bring them to town. I’m equally jazzed to go and see local act Sleepy Kitty for the first time. The Death Cab For Cutie show at the Pageant has been sold the heck out for a while, but thanks to Vintage Vinyl you still have a chance to catch the show’s opener, Michael Benjamin Lerner (aka Telekinesis). Drop by the store in the afternoon for a free in-store performance. Drums will be pounded. Doomtree’s performance was one of my favorite highlights of Kanrocksas and now three members of the Minneapolis hip-hop collective are trekking down to Cicero’s. Local rap trio Robb Steele is assigned to get the party started.